Caligari has just released the latest version of their flagship 3D modeling program, Caligari trueSpace 5.1. It offers many new features such as support for Macromedia Shockwave3D in the "proTeam" version. Most notable is the price of the stand-alone version is only $299. 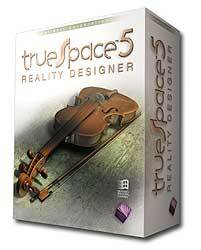 About three months ago, in February of 2001, trueSpace 5 was released for $795, making today's release significant cost savings. If you just bought your new copy or upgraded, don't fret, the "proTeam" version is still $795 and annual renewal fees are $495. With these and more than 200 additional modifications, Caligari trueSpace 5.1 combines a high-end modeling, rendering and animation tool with an intuitive user interface into a more affordable package. Now more product designers, web designers, graphic designers and multimedia developers will be able to use this product. Caligari trueSpace 5.1 runs on Windows from 95 to 2000, including NT and requires a Pentium II CPU, but a Pentium III is recommended. Specific support for the Pentium IV is included. It needs 64 MB of RAM but 128 MB of RAM and hardware 3D video acceleration is recommended.